You are here: Home > T-Mobile At CTIA 2011, What Do You Want To See? It’s the most wonderful time of the year! 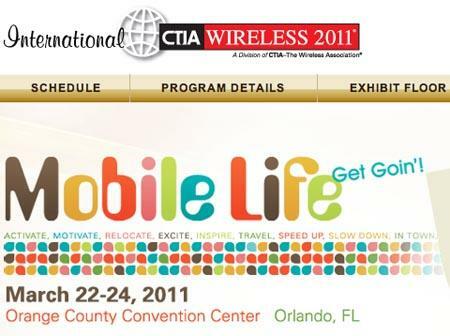 No it’s not the holiday season, rather it’s CTIA 2011 in Orlando, Florida! One of the biggest events in the US wireless industry is descending upon us and yours truly will be there! That’s right, TmoNews will be live from CTIA in Orlando, Florida. Unfortunately T-Mobile will not be holding a press event as seems to be the norm for everyone but Sprint and Samsung (we’ll be there too!) this time around as opposed to last years CTIA with most carriers and manufacturers holding events. So what do you want to see from T-Mobile? While they won’t be holding a press event, we’re sure to see some announcements Monday or Tuesday. Of course we’ll have some hands on time with some new devices Tuesday evening. What new devices do you ask? Well we can’t say anything for sure but we expect to see the Sidekick 4G and the T-Mobile G-Slate. We’re also going to be in attendance at Nokia’s Monday night event where we expect to see the Nokia C7also known as the Nokia Astound in T-Mobile speak will be announced. So what are we hoping for? Well of course we’re hoping for any word, any sort of indication that we’ll get to see the LG G2X and the HTC Pyramid. We’re a lot more hopeful for the former than the latter. Truthfully, I don’t expect to see or hear anything about the HTC Pyramid from T-Mobile but perhaps HTC will drop some hints toward a US release. Aside from phone news, we also expect T-Mobile to make some network announcements, especially regarding the upcoming launch of HSPA+ 42Mbps. It’s likely we’ll get an updated timeframe for the launch including plans for the remainder of the year. Let’s ask the readers, what do you want/hope/expect/need/require T-Mobile to announce? Official release date for the G-Slate. Don’t want to see T-Mobile get too far behind with the release, or it’ll never have a chance. 42.4 Mbps has already been put up in Orlando for this event so they will defineatly be showing off the rocket 3.0 along with lil wayne. They will be showing off the G Slate even though i just found out it will be topping out at 14.4 instead of the 21 mbsp we’ve come to love on the vibrant 4g. looks like we have a problem with the approval of the 3.0 to be shipped out to stores (the device is fine the tester made a mistake) but they should be here soon and the devices to run 42 mbps should be sometime late this summer. Hoping for announcements about the; LG G2X, HTC Pyramid and the GS II – But I am betting we’ll only hear about the LG G2X. Would be nice if it was a T-Mo exclusive and first Android phone with Netflix. i would like 3d, but if its not included then it don’t matter i would just like that, but it’s not a deal breaker. – Definitely want to hear announcements about HSPA++ 42Mbps implementation Time-frames/Locations and theoretical vs. expected speeds … and of course devices that will support it and when to expect those. – Possible iPhone on T-mobile network? Why do people want to see the iPhone on T-mobile’s network. Do you know how much those things bog down the network. I think T-mobile is smart to work on getting the upper end android phones instead. The iPhone releases already under par to the other dual core android devices out there. Just because it says iPhone on it doesn’t mean it is a great phone. Considering how much T-Mobile and Sprint suffer for not having the iPhone, it has become one of those things that could help T-Mobile keep customers. Considering their 4G HSPA+ network is a tried and tested technology, it is quite possible that Apple could decide to finally offer a T-Mobile version because of the HSPA+ network. wait 12 months and you will get your wish!!! The iPhones don’t bog the network any more than an Android or any other smart phone,,, it’s ATT’s garbage network and the amount of users combined with the quantity of web applications available in the Apple store being used that contribute to saturating the ATT network. I think the Android phones are top-notch, especially the ones beginning to arrive. I’ve owned the original iPhone on tmobile’s network for over three years now… not much sense in upgrading to a newer iPhone version since they can’t take advantage of the data service on TMobiles network. I have plans on getting either the Pyramid or G2x if/when they come out but I’d prefer an iPhone because of the simplicity in their user interface and hardware quality, but mainly because every accessory I own is proprietary to the Apple interface for use with iPods and iPhones. I’ll hate to have to upgrade my car stereo and portable speakers so I can dock my new phone to play music everywhere. Sure there are generic analog interfaces on these devices but I also want to control/supply power to my phone while playing music. I hope they announce what “CTIA” stands for, since the author of this article just started using the acronym assuming we knew what it stood for. Ya cause googling is so difficult. That is the difference between people who make things happen and you. I did happen to Google it after reading the article. However, I felt a little sarcasm was due for the author since explaining something so simple as defining an acronym when first used, that one will use throughout an article, is usually standard practice among decent journalists. What’s the point of explaining an acronym? They’re abbreviations for a reason. CTIA used to stand for “Cellular Telecommunications and Internet Association”, now it doesn’t mean anything anymore. It used to be the “Cellular Telecommunications Industries of America”, but it merged with another group to become the “Cellular Telecommunications and Internet Association” at the turn of the century. In 2004, they dropped the acronym completely, becoming “CTIA – The Wireless Association”. You could get the mytouch 4g. Why would you get a mytouch over a dual core processor phone? Especially someone who is contemplating over waiting for the pyramid why would they go down to that? I’d get the G2x if you are itching for a new phone. Great reviews on it in korea. i would hold out for the pyramid. check the review of the optimus 2X on Engadget and you’ll see why. The Optimus 2X review dinged the software, not the hardware. Since the G2X won’t be preloaded with LG’s software, that review doesn’t mean much for us in terms of the G2X. If you read the Investor meeting presentation notes from January, you’d know that T-Mobile USA prizes the G series lineup because it is the lineup of phones that they work extremely closely with Google on preparing for the world. They prize the stock Android experience offered on the G series lineup. Now, that doesn’t mean that they might change their mind and decide to include the terrible software from LG, but it does make it unlikely. Check out anandtech for a comprehensive LG 2x review. My only gripes with the 2x is no led notification and potentially no hspa+. If u need one right now the nexus s for 100 bucks is pretty compelling. HTC Pyramid or GTFO, 4.3″ Android phone is long overdue. I would like to know when the rest of us are going to get 3G. Seriously T Mobile. How far behind the others are you? Humm’er will announce the Cliq 3D. Get every single dirty detail you can about the g2x and the gslate…including why they are launching a month late. Also want to hear about the gs2 and the mysterious pyramid. Thanks. I’d like them to stop throttling my data. The fastest network is meaningless if I can’t use it. I second this. I don’t know why they openly claim their 4G has a “theoretical” speed of 14Mbps when the actual network speed doesn’t even average HALF of that. Has anyone ever seen the 4G speed reach even 10 Mbps? If/When they do upgrade their HSPA+ to 42Mbps I guarantee it won’t reach half of that theoretical speed either, nor the speed of the current HSPA+ network for that matter. Definitely plenty of down-throttling going on. here is what i would like to see, ipad 2 for tmobile, samsung tab 8.9 inch, lg g-slate 3d tablets. i want to see the g2x, pyramid, sidekick 4g, lg 3d phone. these phones can last until november of 2011. then the iphone 5 and samsung galaxy s II phones can be released. t mobile will be a powerhouse. Tmobile about to be bought out by at&t. I want t mobile to announce the samsung galaxy s2 already. I have a feeling tmobile will be late to the party or skipped with this beast. Well, I guess we could hope that “AT&T buying T-Mobile USA” was an early April Fool’s joke, but it doesn’t appear to be. What are you going to name the blog now? I for one would like to see the Nokia N950 Meego device or some Meego Devices announced for AT&T-Mobile US. We already have loads of Android devices coming but hardly nothing from any other OS. The HTC Pyramid and Optimus 3D have my Attention right now but not like the N950!!! I like Android but I want to try something different and Meego is looking like a promising OS. So how about it Nokia or Intel, Bring those Meego Devices!!! CTIA, I’m not getting my hopes up. I would like to see that the LG G Slate and G2X will in fact be released in a pair for an April 20th release. Did the rumors have any fact in them? I’d like to see nothing. I hope people switch to Sprint, because if Sprint also fails, we’re totally F-U-C-K-E-D.
Gotta hate AT&T and I hope the deal goes to the gutters and quick too. I wish you were right and it was that easy, but if they made this public then it means it’s going to happen, plus AT&T will have to pay T-mobile $3 billion if it doesn’t go through…so that tells you they already know it will go through….unfortunately…. does it really matter what tmobile offers from here on out? i know many people that are on tmobile because of either poor customer service or poor network or both from at&t, verizon, and sprint. and remember while your current contract will have to be honored by at&t once that contract expires, even if you don’t upgrade your phone, they are free to switch you over to one of their over priced limited plans without so much as a by your leave. We will be demonstrating our 42+ network. I will be there trying to find a new job. Simple, the only thing I want to see at CTIA in the AT&T-Mobile section is Meego and Meego devices. If there is but one device, I’ll be a happy camper. I dunno how much we will see of T-Mobile at CTIA. T-Mobile has just announced that it is dropping out of its participation in a keynote panel set to kick off CTIA. I want to know why Philipp Humm was successful when he was CEO in Germany, but why he couldn’t do it in the US? It’s sad to see T-mobile go if this acquisition does occurs. I would also like to see the Galaxy S II and the Pyramid at CTIA. Also, I have a question. It’s March 23rd, when are they going to announce all of this with only a day left?!?!?! I thought there were reports saying that the Pyramid was 100% going to be announced at CTIA. I would like to know some darn release dates! I am due for an update and I wanna know how long I should wait for the G2X or the Pyramid.